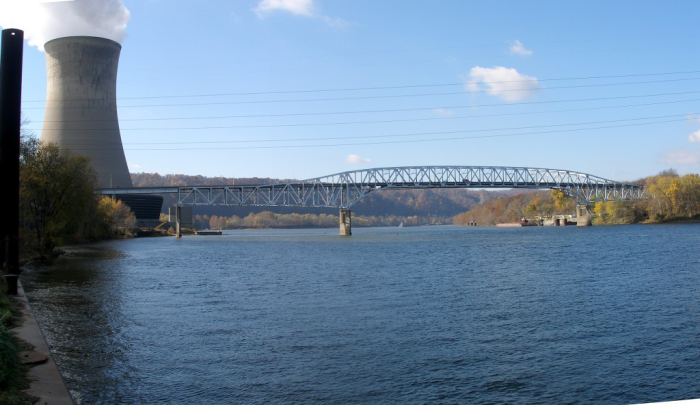 The Shippingport Bridge spans the Ohio River in Beaver County, Pennsylvania. Constructed in 1961, the main river crossing is a three-span, combined deck/through truss bridge more than 1,300 feet long. As part of a larger evaluation and rehabilitation project, Lehigh University’s Advanced Technology for Large Structural Systems (ATLSS) Research Center performed field-testing of this bridge. The scope of the work included controlled-load testing using a test truck of known geometry and weight, and long-term monitoring of the bridge during normal traffic. The ATLSS then used the collected data to estimate the remaining fatigue life at critical points on the bridge. Strain gages and displacement sensors were installed throughout selected spans in locations known to be fatigue sensitive or that would provide insight into the global load distribution characteristics and general behavior of the bridge. The data were collected using a Campbell Scientific CR9000X datalogger, which then transmitted data via wireless modems to a server located in the ATLSS Center, 300 miles away in Bethlehem, Pennsylvania. This link was also used to upload new programs as needed. A fully loaded, triaxle dump truck was used for the controlled-load testing phase of this project. The test truck was driven across the bridge multiple times in each lane at both crawl speed and normal traveling speed. The crawl tests determined the static response of the bridge while the tests at normal traveling speed evaluated the dynamic amplification. The bridge was monitored remotely for about three months. During the monitoring period, the CR9000X was triggered to record high-speed, time-history data when high-stress events were detected. In this way, data records were obtained for crossings of the heaviest vehicles. ATLSS researchers used this controlled-load testing and long-term monitoring to characterize the global and local response of the bridge and to optimize the rehabilitation scheme. Improved confidence in the fatigue life estimates was also achieved.